Installed pouer: 25 Scotch bylers. Fower direct-actin Parsons steam turbines producin 76,000 hp (57 MW). Propulsion: Fower threeple bled propellers. (Quadruple blade propellers installed in 1909). Capacity: 552 first cless, 460 seicont cless, 1,186 third cless. 2,198 tot. 7,000 tons coal. 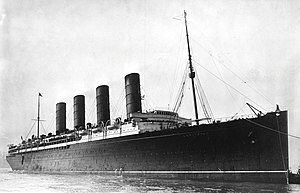 RMS Lusitania wis a Breetish ocean liner that a German submarine sank in Warld War I, causin a major diplomatic rouk. ↑ 1.0 1.1 Atlantic Liners. Layton, J. Kent. "Lusitania Home". Atlantic Liners. Retrieved 18 March 2015. Lundy, Darryl (17 March 2015). "The Peerage". Ngaio, Wellington, New Zealand. Retrieved 18 March 2015. This page wis last eeditit on 21 August 2017, at 03:34.